USNM 10865, shortly after its introduction in 1931. Photo courtesy of the Smithsonian Institution Archives. Since the National Museum of Natural History fossil halls closed for renovation this past April, I’ve made a habit of checking the webcam in Hall 2 every couple weeks or so. For a while, it didn’t look like much was happening – the first waves of de-installation occurred out of view, toward the back of the gallery. Eventually, however, the iconic dinosaur mounts started coming down. The Allosaurus vanished in mid-July. The Stegosaurus and Camptosaurus were gone in September. By late October, the exhibit team had started cutting back the elevated platform and surrounding walkway where most of the standing dinosaur mounts had stood. This was when the process got really interesting, because previous renovations to this space over the past century have always been additive. Old exhibit panels were boarded over and forgotten decades ago, and even some elements of the 1911 Hall of Extinct Monsters, such as the John Elliot fresco “Diana of the Tides”, are still buried in these walls. To hear about these time capsules of science history being unsealed over the past few months has been absolutely thrilling. But when I checked the webcam last Tuesday, I was met with a slight sinking feeling. 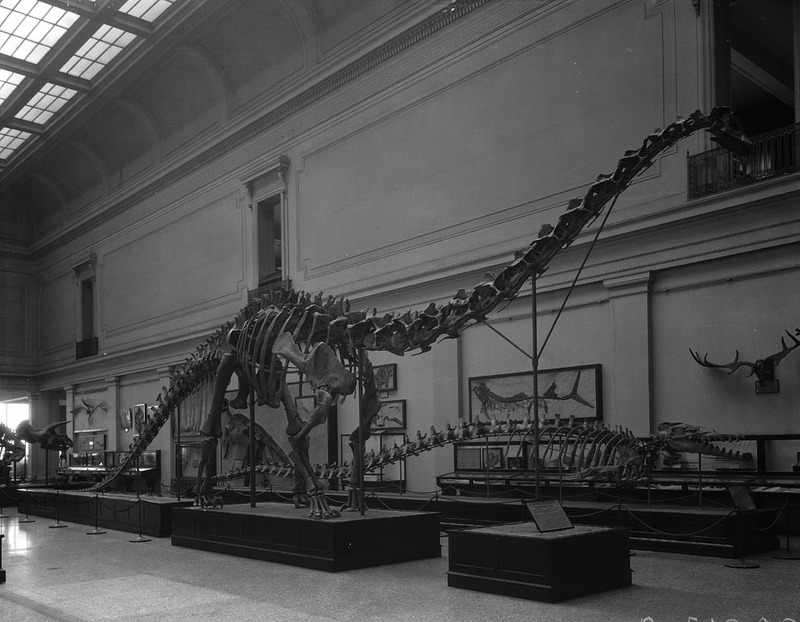 The Diplodocus, the centerpiece of this hall for the last 83 years, was gone. After it was excavated from Dinosaur National Monument in 1923, USNM 10865 took Charles Gilmore, Norman Boss, Thomas Horne, and John Barrett nearly a decade to prepare and mount. Aside from an an adjustment to the neck supports in the early 80s (making it hang from the ceiling, rather than being propped up from the floor), the Diplodocus remained in place and unmodified for longer than the average American lifespan. Generations of visitors have gazed up at it, and those lucky enough to view it before 1963 were able to walk under it. This mount has unquestionably taken on a second life: it is an institutional and regional icon as much as it is a dinosaur that once roamed a Jurassic floodplain. And in three days, NMNH collections staff and specialists from Research Casting International cleared every trace of it – well over 200 individual bones – from the hall. 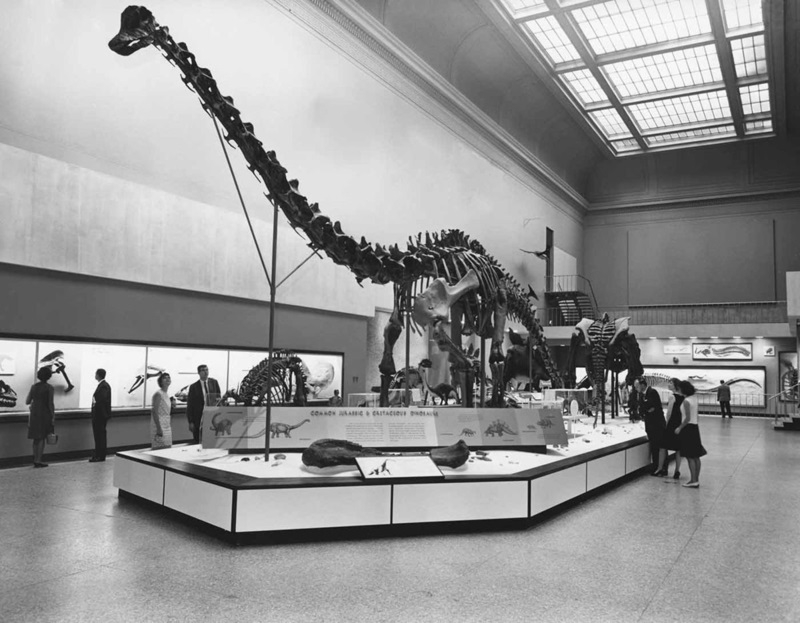 The Diplodocus, as seen from 1963 through 1981. Image courtesy of the Smithsonian Institution Archives. I can’t help but feel a twinge of sadness to see the Diplodocus go. I’ve been visiting the sauropod since before I could talk. I knew it as a toddler, as a high school volunteer, as a fresh-out-of college-intern, and as a museum professional. Even though the fossil halls have been closed for months, I suppose it was comforting to know that the Diplodocus was still standing on the other side of those barriers. 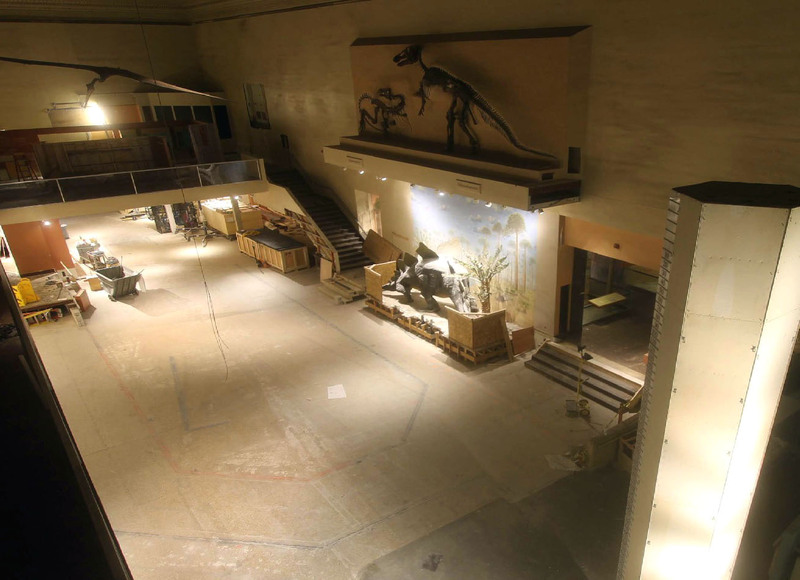 But now it’s actually gone, and that makes it really sink in that the NMNH fossil hall that I knew – the one that inspired and nurtured my life-long interest in paleontology, is gone for good. 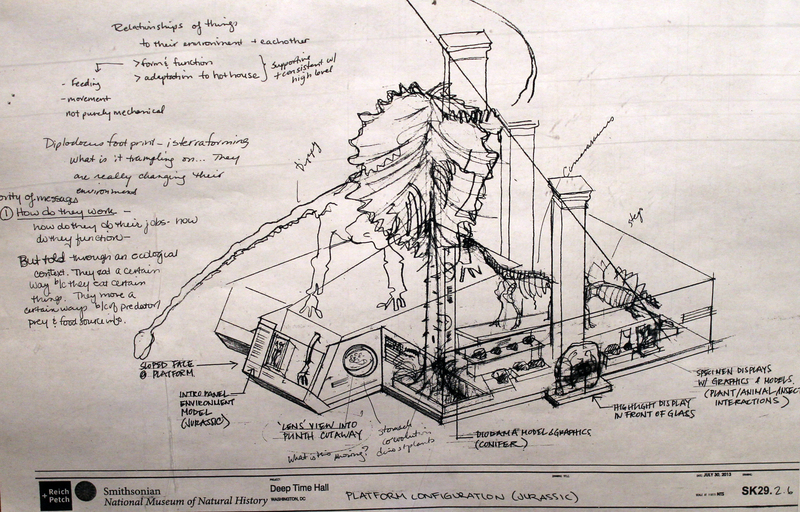 An early sketch of USNM 10865’s new home – anchoring the Jurassic ecosystem display. Of course, the now-disarticulated Diplodocus fossils are in the best possible hands. The veteran team at RCI will conserve, restore, and eventually remount them in a stunning, dynamic pose. What’s more, the renovated fossil hall in which it will be reintroduced is going to be awesome – structurally, aesthetically, and pedagogically. It will contextualize classic specimens like the Diplodocus within a modern understanding of how the ancient past is connected to our present and future, while simultaneously honoring this space’s history and heritage. I can’t wait. You have my sympathy and I hope your Diplodocus returns soon. I had a similar experience about a month ago when my favourite tricycle was suddenly removed from my local transport museum after being exhibited in exactly the same spot for more than 10 years. Thanks for the comment! As important as it is for museums to stay relevant and dynamic, I think it’s worth remembering the attachment some visitors feel to enduring exhibits. There aren’t many other attractions where multiple generations can visit the same things across decades.